St George’s Well, Ffynnon Gemig, Ffynnon Gegidog or Ffynnon Lansansiôr (see note at the end on naming) is a well I’ve often intended to visit but until now never stopped off to investigate. Speeding down the A55 to potentially more interesting sites I was often tempted to turn off just after the marble church at Bodelwyddan at the signpost to Llansansiôr, but mainly because I understood that the well was inaccessible I never have until now. The inaccessible bit is very quickly confirmed and thus again this post will be light on pictures other than those that show the forbidding welcome you receive when you approach the site. 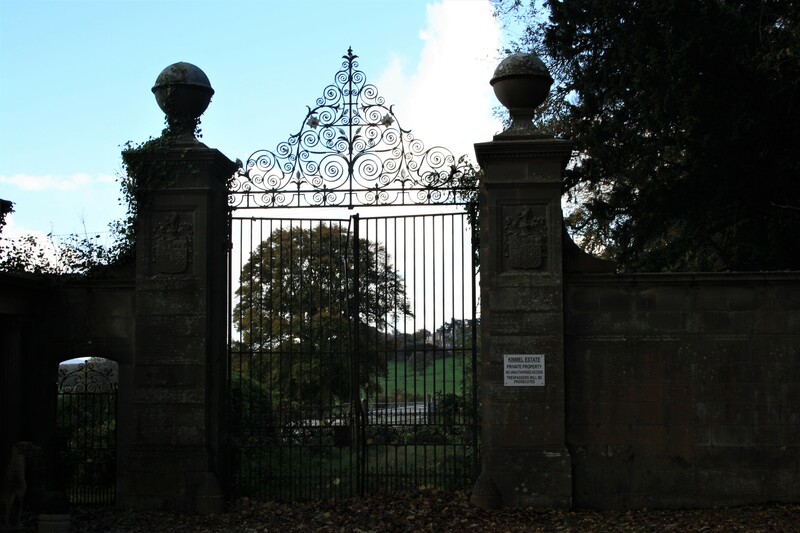 The extremely impressive grade 2 listed gates tower above you as you look up the overgrown driveway to the equally impressive Kinmel Hall, the present incarnation of which dates from the 1870s. The fate of the well in recent years has gone hand in hand with that of the Hall. The hall was used as a hospital during the Second World War, after which it was converted for use as a girls public school. A major fire in 1975 forced the school to close and the hall was reopened as a Christian Conference Centre until this in turn closed in 2001. Since then it appears to have been in the possession of a property development company registered off shore in the British Virgin Islands. Various plans to convert it into a hotel seem to have come to nothing. It appeared on the Victorian Society’s 2015 list of the top ten most endangered buildings. It stands sad and lonely protected by high fences and apparently a complex system of security cameras, motion sensors and taped warning messages. During periods when the hall was occupied access to the well was fairly readily available, and indeed at some times the owners were very encouraging. In the early 1970s a local group worked hard to excavate and restore the well, forming a society Friends of St Georges Well to fund and organise the project. Donations were sought to build up a trust fund to ensure that the well could be maintained going forwards. I’m not sure how long the group remained active, but certainly by the 1990s the well was once again becoming lost. For the history of the well we are indebted to an excellent booklet produced by John Beckett in 1974, the heyday of the well’s restoration project. Beckett does an admirable job in differentiating between the actual recorded history of the well (which is limited) and the later unsubstantiated musings and deviations from fact (which are many). His booklet is something of an object lesson in picking out wheat from the chaff in the writings of antiquarians and folklorists from the 18th through to the 21st century. According to Beckett virtually all we know of any custom or tradition associated with the well is drawn from two letters to antiquarian Edward Lhuyd dating from 1697 and 1701 in response to his Parochial Queries survey. The well of St George where in former days horses used to be offered and also one for the parson according to tradition. Having just done my Parochial perambulations on Ascension Day…. One of the most material ceremonies in the procession, which was to visit St Georges Well and to read a prayer or two by it as they usually do at a crossroad, the principal standing amongst us. Our St George has been reckoned the tutelary patron of horses and they have used within these twenty years to bring horses from Caernarfonshire and the Uwchmynydd of Denbighshire to this well where they threw some of the water over the horses saying Rhad duw a St Sior arnat, then offering a groat to the church box. Beckett focuses on the word offering in relation to the horses, pointing out how this has been interpreted in successive accounts of the well whether horses were either given to the parson alive or even sacrificed at the well. At this well it would seem that horses were actually sacrificed, one being given to the parson. Again sacrifice could have a double meaning, either just to go without and give to the parson, or to actually kill. One has to assume that Jones is inferring the latter. It is notable however that even in 1701 Ffoulkes, a parson who might well have benefitted from the donation of a horse omitted to mention the custom, stating that a groat was the accepted offering. Beckett refers to an account from 1535 noting a sum of 23 shillings given in donations at St George’s, though it is not clear whether this is to the church or to the well. A number of authors have drawn attention to a number of other horse linked place names (Meirch) within the immediate landscape. In particular Parc- y-Meirch is close by, the site of the discovery of a large horde of Bronze Age horse harness fittings in the nineteenth century. Whether the use of the well for horses is linked to a wider set of horse related customs in the area can only be speculation. Clearly we are left with the conclusion that this well gained a reputation across North Wales as a site for bringing horses to be blessed. This custom had effectively died out by around 1700 although it remained in living memory. However, even then the well formed part of an Ascension Day beating the bounds perambulation (it lies close to the parish boundary) and was, we assume, still known and used. Wells as waymarkers on parish boundaries are common, and the practice of perambulation on certain days of the year with customs at specific points, including wells, was standard practice. However, use must have declined. Although Pennant mentions its existence he doesn’t report seeing it, nor do other travel writers of the late 18th and early 19th centuries. It was clearly not of tourist interest, even those horse-borne, as a noted site for horse blessing in a village with little else to interest the visitor. We know that up until around 1871 it wasn’t within the boundaries of the parkland of Kinmel Hall, it is shown as such on the 1871 Ordnance Survey map. Before this it lay within a farm called Gemig, from which it obtains its alternative name Ffynnon Gemig. It sometime during the 1870s, presumably at the time of constructing the present Hall building, that the grounds of Kinmel Hall were extended and the road to the village realigned, at which period the well is pulled into the parkland. Gemig farm appears on the tithe maps but must have been demolished during the extension of the park. The hall was owned by the Hughes family, and occupied up until the late 1920s. Clearly access to the parkland to some degree must have been available to local residents since it is John Beckett again who says his earliest memories of the well were being taken to sit beside it by his brother at school lunchtimes in around 1906. This spring is situated in a glade of Kinmel Park. It is now nearly dry. The form of the well is a rude oval, about 15 feet long by 8 feet broad; the chamber is constructed of large stones and there is a wide channel for carrying off the overflow. It was towards the end of the 1960s that a group of locals, John Beckett included, took it upon themselves to thoroughly investigate and restore the well. This would seem to have been done in an organised and professional manner, with advice sought and taken from experts from the RCAHM and the Department of the Environment. Clearance and excavation took place over about four years. 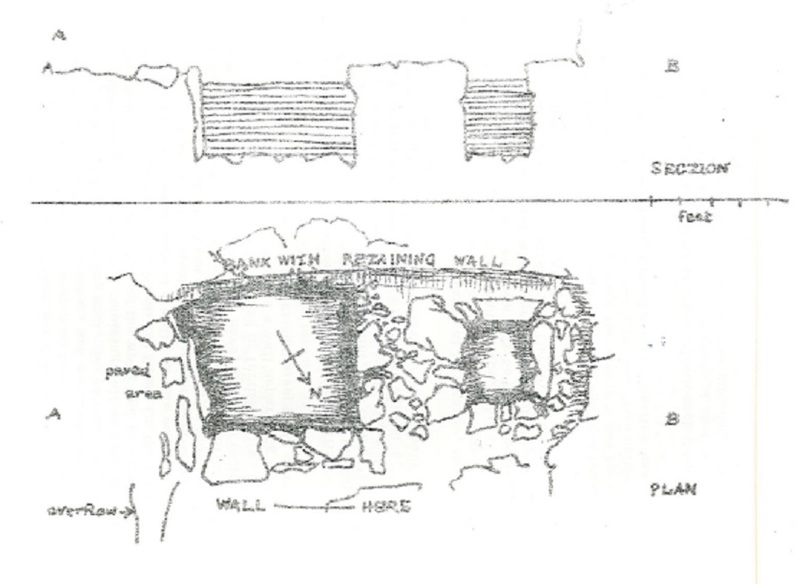 During the work in 1973 the site was accorded the status of a scheduled monument. What was found exceeded all expectation, and a much more complex site was found than that described by the Royal Commission in 1912. The layout is essentially two square stone lined basins with a stone floor surrounding the two. There is a smaller pool around 30 inches square and to its east a larger pool about five feet by six feet. The spring flows into the smaller basin from where it flows into the larger pool. This two pool layout is reminiscent of other wells including Ffynnon Gybi at Llangybi, Ffynnon Fyw at Mynytho and Ffynnon Wenfaen at Rhoscolyn. There is then a stone lined channel which carries water away to the north east from the larger pool. The tree growing through the side was removed later during the clearance. I have taken the liberty of reproducing a cross section and plan from Beckett’s book. When the work was finished, stones were replaced an iron fence was constructed around for protection, and initially at least regular maintenance was carried out to prevent weed and tree growth damaging the site. … almost impossible to see the well. Trees were growing through it and there were thorns and brambles everywhere covering the black water with all kinds of vegetation. Following discussions with the site’s then owners the tenant cleared the well, although it was clear that there was a general intent then to discourage visitors to the well and the openness of the earlier times was gone. Around this time proposals were also aired to excavate land below the well and to dam the outflow to form into a pool to attract wildlife to the area. An inspection in 1999 suggested that this might have been done although the site was once again overgrown. It doesn’t show on aerial pictures of the site today. One assumes that it was following the closure of the conference centre in 2001 that access to the well was effectively lost. Thus, the fate of the well remains to a great extent subject to the fate of the hall. This isn’t the only case of a massive Victorian building, apparently too important to lose but too expansive to save. Is it inevitable that it is gradually going to crumble into ruin? And stuck in the middle of this process is a significant, still solidly constructed well complex, potentially one of the best preserved in the area. However there seems no desire to facilitate access to the well. So here we have learned a salutary lesson, showing that the best laid plans for well restoration can only be short lived without the long term engagement of both community and land owners. We can only hope, but with little confidence, that at some time in the not too distant future it can once again be cleared and suitable access provided. Both parish and well have a number of names. The parish today is generally known as St George, or its direct Welsh translation Llansansiôr. In the 12th century the parish was known as Cegidog,,assumed to be derived from Cegid – hemlock, which grew in abundance. This name has persisted in parallel over the years. Lhuyd’s correspondent in 1697 referred to the well as being the well of Llansansiôr; his successor in 1701 called it St George’s Well.which is how it appears on all mapping of the area. Up until the mid-nineteenth century the well lay on land belonging to a farm called Gemig,and thus it also carried the name Ffynnon Gemig which is the name most writers appear to prefer these days. It is also referred to as Ffynnon Gegidog after the alternative name of the parish. 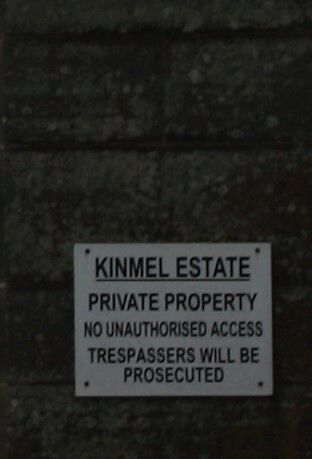 Information on Kinmel Hall has been sourced from Wikipedia and from the website of The Victorian Society.